Switch to from iPhone to a new Android mobile? Want to transfer iTunes to Android? Have no idea how to? Believe you have already searched lots of solutions from the internet. But due to its complex operations or invalid methods, you cannot transfer iTunes to Android phone successfully. Most of you finally give up finding the right solution; just copy the files manually like contacts, which would absolutely waste much time! How about some other files which are unable to be copied manually like music, text message and more? What you need is a third helper! How to transfer iTunes to android phone? iMyFone TunesMate is fully capable of assuming this duty. It is popularly used by millions of people and gets the positive feedback from all the users, as it perfectly lets iTunes transfer to android. 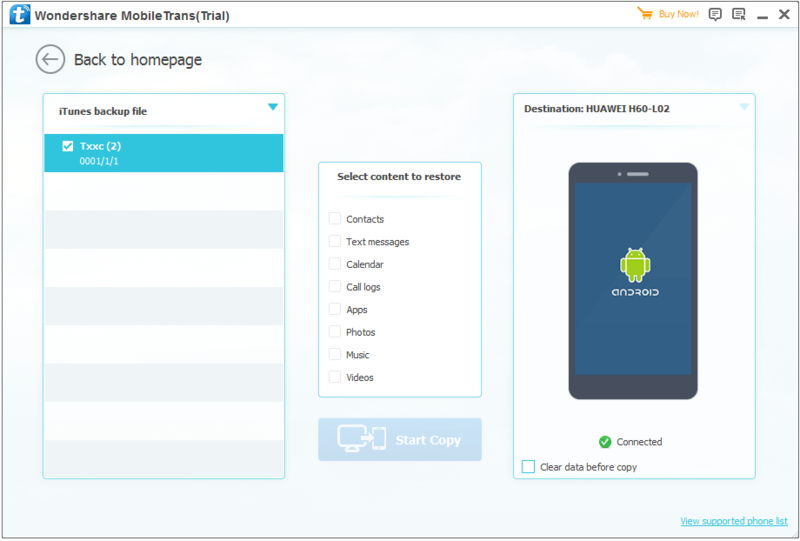 Phone Data Transfer allows you to free try the software and enjoy its glamour. Note: Under the trial version, you are allowed to free transfer first FIVE contacts from iTunes backups to Android phone. Download the program first and install it in an appropriate hard drive. Then run it on your computer. An interface will show you four kinds of modes. You are supposed to select the mode of “Restore from Backups”. Continuously, you need you click “iTunes” to extract iTunes backups to Android phones or tablets. Connect your Android phone to computer via a USB cable and let the program detect it successfully. Meanwhile, make sure that iTunes is installed in your computer. Then your iPhone name will show under the “iTunes backup file”; click it and select the contents on the middle part of the window. Last, click “Start Copy” to proceed iTunes transferring to android phones. Re-connect your Android to PC with its original USB cable. Select the Media device (MTP) or Camera (PTP) / Send images (PTP) option once your mobile is connected to computer.